Prof Swaran Singh speaks to CCTV America on World Mental Health Day. Dr Stephen Lawrence, Principal Clinical Teaching Fellow, examines the potential impact of new NICE guidelines in primary care, the pros and cons of the new guidelines and the controversy that remains among diabetes experts about the inclusion and omissions of the guidelines. Like you, we want patient care to be the best it can possibly be. We believe our courses can give you the confidence and skills to make a tangible difference in healthcare. More about Postgraduate Education and professional development at WMS. Our four-year MB ChB is designed to help you become a highly competent and strongly motivated doctor. Our innovative and distinctive programme is the largest graduate-entry course in the UK with an intake of over 170 graduates each year. Learn more about the Warwick MB ChB. To support our students, we've produced video guides to different apects of clinical examinations. Videos include examinations of the abdomen, the respiratory system, the shoulder and taking clinical histories. Our full range of clinical examination videos is available on our YouTube channel. Our programme in Interdisciplinary Biomedical Research allows you to spend a whole year conducting your research in a cutting edge lab. What's more it gives you the skills needed to have a real impact upon biomedical research. Learn more about our Interdisciplinary Biomedical Research programme. By training the best talent, developing research capacity and fostering national and international collaborations, we seek to solve some of the world's most pressing health problems. WMS offers full and part time research degrees that can improve patient health coutcomes, change care pathways and improve service organisation. 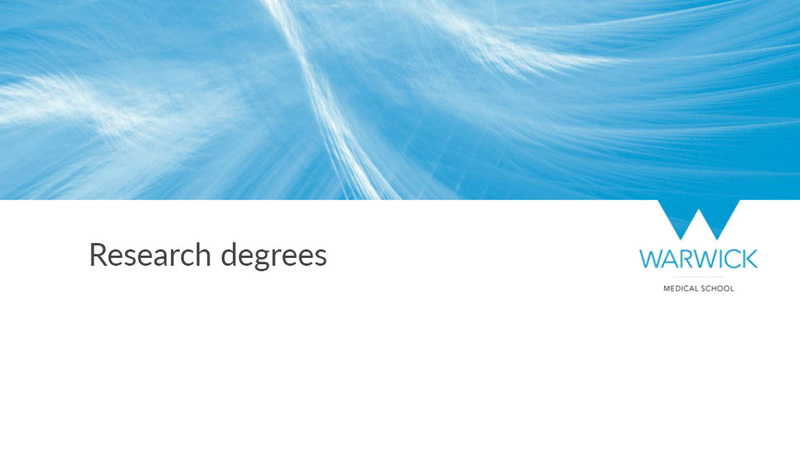 Learn more about Research degrees at WMS. ‘The Picture of Health: Exploring the Future of Medicine’ event gave an audience the opportunity to quiz our panel of experts. The audience included medical professionals, staff from the university, med students, the general public and now you, as you watch this video of some of the best bits of the evening. These videos highlight the various specialist areas available to study at postgraduate level at Warwick.